Last week we launched the popular Spa Solutions Kit; a unique product containing three attachments for the Cleansing and Polishing Tool to create a revitalizing spa experience that you can enjoy in your very own home! 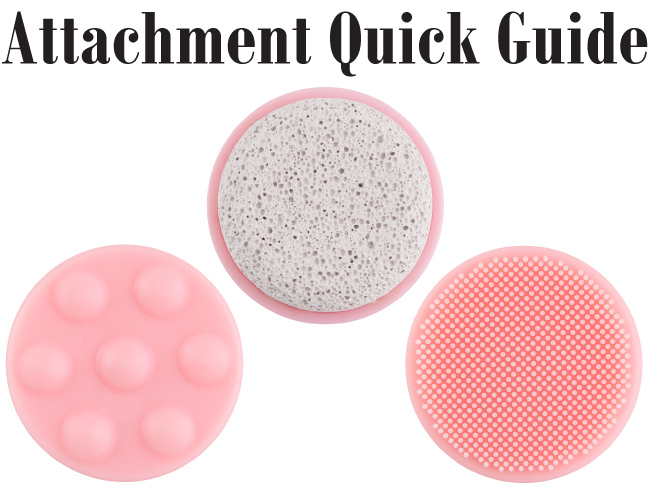 We wanted to provide you with as much detail as possible of how to use each attachment so you can get the most out of your Spa Solutions Kit! Keep reading to view our Spa Solutions quick guide! This extra-soft brush attachment is recommended for gentle cleansing of extra sensitive skin. To use, simply add a small amount of your favorite facial cleanser directly onto the brush head. After wetting the face, use the tool to cleanse the face using small, circular motions for 1-2 minutes. Rinse and follow with the massager attachment for best results in achieving the smoothest skin possible! Made of silicone. The massager maximizes absorption of skin care products and stimulates skin circulation. After cleansing with the extra-soft brush head, generously apply your favorite essential oil, serum or moisturizer to the face. Use the massager to help skin fully absorb the product to get fresh, glowing and moisturized! Made of silicone. The exfoliator was specially designed to create soft, touchable skin on the feet. The pumice stone gently exfoliates the feet to smooth away calluses and rough skin. This is your go-to attachment to remove dead skin cells and reveal healthy-looking skin. To get the best results, use exfoliator attachment on damp skin. Made of pumice. After each use, make sure to rinse off your attachments to keep them in the best condition possible. Let us know if you have any additional questions about this fabulous kit! Fiz uma postagem em meu blog sobre elas!